Gulf Air (Arabic: طيران الخليج‎‎ Ṭayarān al-Khalīj) is the principal flag carrier of Bahrain. Headquartered in Muharraq, adjacent to Bahrain International Airport, the airline operates scheduled services to 41 destinations in 23 countries across Africa, Asia and Europe. Its main base is Bahrain International Airport. Unlike its largest rivals Emirates Airline, Etihad Airways, and Qatar Airways which focus on transit passenger traffic through their respective hubs, Gulf Air has focused on point-to-point passenger traffic. The airline has suffered financial losses in recent times, however has begun a restructuring process to limit operating losses and return the airline to profitability. In the late 1940s Freddie Bosworth, a British pilot and entrepreneur, began an air taxi service to Doha and Dhahran from Bahrain. Bosworth later expanded service and on 24 March 1950 registered Gulf Aviation Company Limited as a private shareholding company. This makes its current operating company, Gulf Air, one of the oldest carriers in the Middle East. The early fleet contained seven Avro Ansons and three de Havilland DH.86B four-engine biplanes. In October 1951, British Overseas Airways Corporation (BOAC) became a major shareholder in Gulf Aviation, holding a 22% stake through the BOAC subsidiary company BOAC Associated Companies. In 1973 the governments of the Emirate (now Kingdom) of Bahrain, the State of Qatar, the Emirate of Abu Dhabi and the Sultanate of Oman agreed to purchase the BOAC Associated Companies holding in Gulf Aviation. The Foundation Treaty was signed on 1 January 1974 and gave each government a 25% shareholding in Gulf Aviation, which became a holding company. The operating company was now branded as Gulf Air and became the flag carrier for the four states. With leased Lockheed L-1011 Tristar and Boeing 737 aircraft joining the fleet, by 1976 Gulf Air had expanded its route network to include Amman, Amsterdam, Athens, Baghdad, Bombay, Bangkok, Beirut, Cairo, Colombo, Delhi, Dhaka, Hong Kong, Jeddah, Karachi, Khartoum, Larnaca, Manila, Paris, Ras al-Khaimah and Sana'a. The fleet comprised four Vickers VC10, three BAC One-Elevens, two Lockheed L-1011 Tristar 200s and five Boeing 737–200s. In 1978, the airline doubled the Tristar fleet to replace the VC10s. Meanwhile, the airline increased the Boeing 737 fleet to nine and phased out the One-Elevens. The 1980s saw an increase in air travel and growth for Gulf Air. In 1981 Gulf Air became an IATA member and in the following year became the first international airline to land at Riyadh. In 1985, Emirates, the national startup and national carrier of Dubai, United Arab Emirates began operating, which would later become a major rival of Gulf Air. In 1988 the Boeing 767s joined the fleet and the airline launched service to Frankfurt, Istanbul, Damascus, Dar es Salaam, Fujairah and Nairobi, and resumed service to Shiraz and Baghdad. Gulf Air celebrated its 40th anniversary in 1990. The light blue and peach Balenciaga-designed uniform was introduced. Singapore, Sydney and Thiruvananthapuram were launched and Gulf Air became the first Arab airline to fly to Australia. Gulf Air added service to Johannesburg and Melbourne in 1992, becoming the first Arab airline to fly directly to these cities. In 1993, it opened up a flight simulator centre in Qatar, and introduced service to Casablanca, Entebbe, Jakarta, Kilimanjaro, Madras, Rome, San'a', Zanzibar and Zürich. 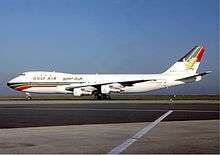 In May 1994, Gulf Air received its first Airbus A340-300. Gulf Air introduced a no-smoking policy on flights to Singapore and Australia in 1998, which the airline later extended through its whole network. In 1999, Gulf Air launched three new routes in northern Pakistan—Islamabad, Lahore, and Peshawar. It also took delivery of two out of six Airbus A330-200 aircraft, and introduced a new Balmain uniform. The Gulf Air website opened in January 1997. In 2000 the airline celebrated its 50th anniversary. It took delivery of the remaining Airbus A330-200 aircraft in June and launched service to Milan. In May 2002, James Hogan became President and CEO of Gulf Air and instigated a three-year restructuring and turnaround programme, which was launched in response to a drastic fall in profits at the company and increasing debt. The Gulf Air board unanimously approved the three-year recovery plan at the extraordinary general meeting held on 18 December. By 1 August 2002 the State of Qatar announced intentions to withdraw from Gulf Air. The state remained a member state for a six-month period after announcing the intention to withdraw. In 2003 Gulf Air introduced a new Landor Associates designed livery. On June the establishment of Gulf Traveller, a subsidiary all-economy full-service airline. Gulf Air also announced a sponsorship deal for the Bahrain Grand Prix through 2010, creating the Gulfair Bahrain Grand Prix, of which the first was staged in 2004. Gulf Air also introduced daily flights to Athens and Sydney via Singapore on 23 November 2003. In 2004, Gulf Air introduced direct flights between Dubai and London and Muscat and London, and a daily service between Abu Dhabi and Ras Al Khaimah and carried a record 7.5 million passengers during this year. Gulf Air's sponsorship of the Bahrain Formula 1 Grand Prix continued, with a record race crowd and a global TV audience. The airline announced a return to profit, with the best financial performance since 1997. Despite a BD30 million (US$80 million) cost to the business through fuel price rises during the year, Gulf Air recorded a profit of BD1.5 million (US$4.0 million) in the calendar year to December 2004, on revenues up 23.8% to BD476.3 million (US$1.26 billion) (2003: BD 384.6 million / USD1,020.2 million). The results meant the airline out-performed the targets set under Project Falcon, the three-year restructuring plan approved by the Board in December 2002. The owner states of Gulf Air at that time—the Kingdom of Bahrain, the Emirate of Abu Dhabi, and the Sultanate of Oman—confirmed their support for further expansion of the airline through a new three-year strategic plan which would include re-equipment of the aircraft fleet and recapitalization of the business through private sector financing. Gulf Air was also placed on the IOSA registry following its successful completion of the IATA Operational Safety Audit (IOSA). The new summer schedule commencing 28 April 2006 saw the complete withdrawal from Abu Dhabi as a hub following the decision on 13 September 2005 by the Emirate of Abu Dhabi to withdraw from Gulf Air and establish its own airline, Etihad Airways. Gulf Air changed its operations to a dual hub basis between Bahrain and Muscat airports. The airline produced a series of adverts in local newspapers thanking Abu Dhabi for its contribution to Gulf Air. Due to the airline being the national carrier for the United Arab Emirates for over 35 years, it has a large customer base located in Abu Dhabi. Gulf Air endeavoured to show the continuing support for flights to Abu Dhabi from Bahrain and Muscat, connecting to the rest of the Gulf Air network, via advertisements placed in local newspapers. James Hogan resigned as President and Chief Executive Officer as of 1 October 2006 and has since taken the position of CEO at rival airline Etihad. Ahmed Al Hammadi was named acting chief executive officer until Swiss national André Dosé, the former chief executive officer of Crossair and Swiss International Air Lines, began on 1 April 2007. A few days later, Dosé announced a BD310 million (USD825 million) restructuring plan that included originating or terminating all flights in Bahrain, ceasing routes to Johannesburg, Dublin, Jakarta, Singapore, Hong Kong and Sydney; eliminating all Boeing 767s and Airbus A340-300s from the fleet; introducing the Airbus A321 in July 2007 and the Airbus A330-300 in 2009; and terminating employees based on performance and without regard for nationality. This led to some employees applying for jobs in other airlines and, in less than a month, Gulf Air lost 500 persons from its workforce, prompting the airline to rule out mass layoffs as part of its recovery plan, except for performance reasons. 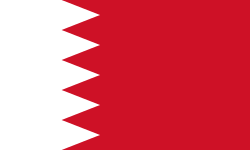 On 5 May 2007, the government of Bahrain claimed full ownership of the airline as joint-owner Oman withdrew from the airline. André Dosé resigned on 23 July 2007 and was replaced by Bjorn Naf. On 6 November 2007, Gulf Air started its third daily nonstop flight to London Heathrow Airport from Bahrain. On the same day, Gulf Air became fully owned by Bahrain. The airline inaugurated services to Shanghai Pudong International Airport on 16 June 2008(The route was terminated on 25 December 2009). It also placed orders with Boeing (for 24 787s) and Airbus (for 15 A320s and 20 A330s) to upgrade its fleet. The airline's last commercial Boeing 767 flight was on 29 May 2008. On 3 July 2008, Gulf Air was announced as the official sponsor of upcoming English association football club, Queens Park Rangers. The same year Gulf Air signed a lease agreement for five aircraft with International Lease Finance Corporation (ILFC) as part of the airline's growth and expansion strategy. The lease was for six years for two Airbus A319s and three Airbus A330-200s, due for delivery in March, April and May 2009. In March 2009, Gulf Air signed a 42-month lease agreement with Jet Airways for four Boeing 777-300ERs, but the aircraft were returned to Jet Airways starting in September 2009. In May, Gulf Air inaugurated summer seasonal flights to Alexandria, Aleppo and Salalah. On 1 September 2009, Gulf Air resumed flights to Baghdad. Services to Najaf and Erbil began shortly afterward. Starting June 2009, Gulf Air's Golden Falcon logo was to be on the streets of London, emblazoned on the side of the city's taxi cabs, as part a two-year marketing deal. Fifty Hackney Carriages were to be rolled out in full Gulf Air livery to promote the airline's flights from London Heathrow to Bahrain and beyond. Later in June, the carrier announced the departure of CEO Bjorn Naf and the appointment of Samer Majali (who worked previously for Royal Jordanian) as CEO effective 1 August 2009. On 1 March 2010, Gulf Air launched its new "Falcon Gold" cabin, a single premium cabin that is aimed at offering higher standards of comfort for the standard premium price. As of August 2011, the new Flat Beds were installed on all aircraft except short-haul aircraft. On 5 September 2011, Gulf Air appointed Dr. Jassim Haji as Director of Information Technology, reporting directly to the CEO of the airline. Gulf Air temporarily suspended flights to Iran, Iraq and Lebanon during the height of the Bahraini uprising. The airline originally was to resume service to Iran from November 2012 but cancelled that plan as the airline was unable to receive approval from the Iranian authorities. Flights to Iran were later resumed in March 2014. In November 2012, Gulf Air phased out its last Airbus A340-300 after 18 years of service. At the end of November 2012 it was announced that Gulf Air CEO Samer Majali's resignation had been accepted by the Board of Directors. Majali left by the end of 2012 after serving the company for three years. Maher Salman Al Musallam was the acting CEO of Gulf Air until May 2016 when he was officially appointed to the role. At the Bahrain Airshow in January 2016, Gulf Air ordered 17 A321neo and 12 A320neo aircraft for delivery from June 2018, and cancelled a commitment to acquire 6 A330-300 aircraft. In addition, the airline also announced an restructured order for 16 Boeing 787-9 aircraft. The new order of 16 Boeing 787-9 aircraft replaced an existing order for 16 of the smaller Boeing 787-8 aircraft. Gulf Traveller was the all-economy full service subsidiary airline of Gulf Air. Its main base was Abu Dhabi International Airport. 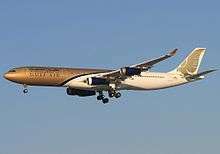 It was briefly relocated between Bahrain and Muscat airports after Abu Dhabi pulled out of the Gulf Air consortium in 2005, and in May 2007 Oman also pulled out of the group leaving Bahrain as sole owner of Gulf Air. Gulf Traveller has since been disbanded due to these changes. In 2011, due largely to political unrest in the state of Bahrain, Gulf Air lost BHD95 million (USD250 million). In 2012, the airline's loss grew to BHD196 million (USD520 million). The airline recognized the growing loss, and in 2013 decided to implement a turnaround plan that involved cutting the size of the airline's fleet, number of staff, and number of destinations. In 2013, the airline faced a BHD93.3 million (USD247.6 million) loss. In 2014, Gulf Air incurred a BHD62.7 million (USD166.4 million) loss, a 32.8% improvement from the following year. In 2015, Gulf Air sustained a BHD24.1 million (USD63.9 million) loss, a 62% reduction from the previous year, and an overall 88% reduction from 2012. As of November 2016, Gulf Air flies to 40 international destinations in 23 countries across Africa, Asia and Europe from its hub at Bahrain International Airport. Gulf Air's own Falcon Gold lounge could be found at the airports of Bahrain, Dubai and London–Heathrow. 23 September 1983: Gulf Air Flight 771 was a flight from Karachi, Pakistan to Qatar via Abu Dhabi, United Arab Emirates, while the Boeing 737-200 was on approach to Abu Dhabi International Airport, a bomb exploded in the baggage compartment. The aircraft crashed in the desert near Mina Jebel Ali between Abu Dhabi and Dubai in the UAE. All seven crew members and 105 passengers died. Most of the dead passengers were Pakistani nationals, many returning to jobs in the Gulf after spending the Eid ul-Adha holiday with their families in Pakistan. The bomb was apparently planted by the Abu Nidal Organization, to convince the Gulf States to pay protection money to Nidal so as to avoid attacks on their soil. 23 August 2000: Gulf Air Flight 072 crashed into the Persian Gulf on approach to Bahrain International Airport from Cairo. The Airbus A320 with 143 passengers and crew on board approached the landing at higher speeds than normal and carried out an unusual low altitude orbit in an attempt to correct the approach. The orbit was unsuccessful and a go-around was attempted. While carrying out a turning climb the aircraft entered a descent at 15 degrees nose down. The aircrew did not respond to repeated GPWS warnings and approximately one minute after starting the go-around the aircraft disappeared from radar screens. All 143 passengers and crew, including 36 children, were killed in the accident. The accident investigation concluded that the primary cause of the crash was pilot error (including spatial disorientation), with a secondary factor being systemic organizational and oversight issues. Flight 072 was the highest death toll of any accident involving an Airbus A320 at that time. It was subsequently surpassed by TAM Airlines Flight 3054, which crashed on 17 July 2007 with 199 fatalities. On 29 August 2011, Gulf Air Flight 270, using an Airbus A320-214, from Bahrain to Cochin carrying 143 people, skidded off the runway on landing due to pilot error of loss of situational awareness during reduced visibility conditions. The weather was poor with heavy rain and strong winds. The aircraft was badly damaged with nose gear collapsed and seven passengers were injured. Some people were reported to have jumped from an emergency exit when the evacuation slide failed to deploy. 1 2 3 report, Staff (2015-09-15). "Gulf Air reports Bhd62.7m in losses in 2014". GulfNews. Retrieved 2016-11-29. 1 2 3 "gulf air reduces losses by 88% in the three years since it embarked upon its restructuring strategy | Gulf Air". www.gulfair.com. Retrieved 2016-11-29. 1 2 3 4 5 6 7 8 9 10 11 12 "Gulf Air History". Gulf Air. Gulf Air. Retrieved 11 June 2015. 1 2 "Gulf Air adds new routes to China and India; increasing capacity to Europe this winter". anna.aero. 3 October 2008. ↑ "A Message from Gulf Air's President & Chief Executive." at the Wayback Machine (archived 9 December 2000) Gulf Air. 9 December 2000. Retrieved on 29 May 2011. ↑ "GULF AIR STATEMENT – OWNER STATES." at the Wayback Machine (archived 26 February 2003) Gulf Air. 1 August 2002. Retrieved on 29 May 2011. ↑ Chief, Habib Toumi, Bureau (2007-05-06). "Bahrain now sole owner of Gulf Air". GulfNews. Retrieved 2016-11-29. ↑ "Gulf Air adds three Iraqi cities". AMEInfo.com. 6 August 2009. Retrieved 15 July 2010. ↑ Sambidge, Andy (2 June 2009). "Gulf Air signs two-year London taxis marketing deal". Arabian Business. Retrieved 15 July 2010. ↑ "Bahrain's Gulf Air says Iran holds up flight resumption". Reuters. 2016-10-17. Retrieved 2016-11-29. ↑ "Bahrain's Gulf Air to resume flights to Tehran next month". Reuters. 2017-02-10. Retrieved 2016-11-29. ↑ "Gulf Air ups A320neo order but cancels new A330s". Flightglobal.com. 2016-01-21. Retrieved 2016-11-29. ↑ "Bahrain's Gulf Air orders 19 Airbus A320 planes | The National". Retrieved 2016-11-29. ↑ Moor, Dave. "Chelsea". Historical Football Kits. Retrieved 21 May 2012. ↑ Moor, Dave. "Queen's Park Rangers". Historical Football Kits. Retrieved 21 May 2012. 1 2 "Bahrain to continue to back Gulf Air, but carrier may emerge radically changed | CAPA - Centre for Aviation". centreforaviation.com. Retrieved 2016-11-29. ↑ "Gulf Air Destinations Map". Gulf Air. ↑ "Lounges - Gulf Air". Gulf Air. Retrieved 14 July 2012. ↑ "Profile on Gulf Air". CAPA. Centre for Aviation. Archived from the original on 2016-10-31. Retrieved 2016-10-31. ↑ Bombardier Inc. (4 June 2013). "Bombardier Discloses Gulf Air as Airline Customer for 10 CSeries Aircraft and Options for Another Six". Retrieved 4 June 2013. ↑ Gulf Air historic fleet list at airfleets.net. Retrieved 31 March 2011. ↑ "Accident Database". AirDisaster.Com. Retrieved 15 July 2010. ↑ "Abu Nidal - The Sooner the Better". International Institute of Counter-Terrorism. Retrieved 20 June 2012. ↑ "Airbus A320 A40-EK accident record". Aviation Safety Network. ..significantly higher than standard aircraft speeds during the descent and the first approach... ...performing an orbit, a non-standard manoeuvre, close to the runway at low altitude"..
↑ "ACCIDENT INVESTIGATION REPORT Gulf Air Flight GF-072". Civil Aviation Authority of Bahrain. Archived from the original on 12 February 2004. ↑ "Airbus A320 A4O-EK accident record – Graphic – A40-EK Flight Path dervied from Lat and Long FDR Parameters". Bureau Enquetes-Accidents. Aviation Safety Network. ↑ "Sheik Hamad bin Isa Khalifa". CBS News. Retrieved 20 December 2010. ↑ "Airbus A320 A4O-EK accident record". Aviation Safety Network. The investigation showed that no single factor was responsible for the accident to GF-072. The accident was the result of a fatal combination of many contributory factors, both at the individual and systemic levels. ↑ "Accident to Airbus A320 Aircraft A9C-AG of M/S Gulf Air at Cochin International Airport on 29th August 2011" (PDF). Directorate General of Civil Aviation. Retrieved 4 June 2016. ↑ Hradecky, Simon (29 August 2011). "Accident: Gulf Air A320 at Kochi on Aug 29th 2011, runway excursion". The Aviation Herald. Retrieved 4 June 2016. Kaminski-Morrow, David. "Gulf Air must expand or risk being smothered: chief executive." Flight International. 13 June 2008. Kaminski-Morrow, David. "Gulf Air insists alliances will need Middle Eastern partners." Flight International. 10 June 2008. Pilling, Mark. "Is Gulf Air relevant anymore?" Flight International. 12 August 2008. Wigglesworth, Robin. "Gulf Air faces stormy skies." Financial Times. 12 August 2008.